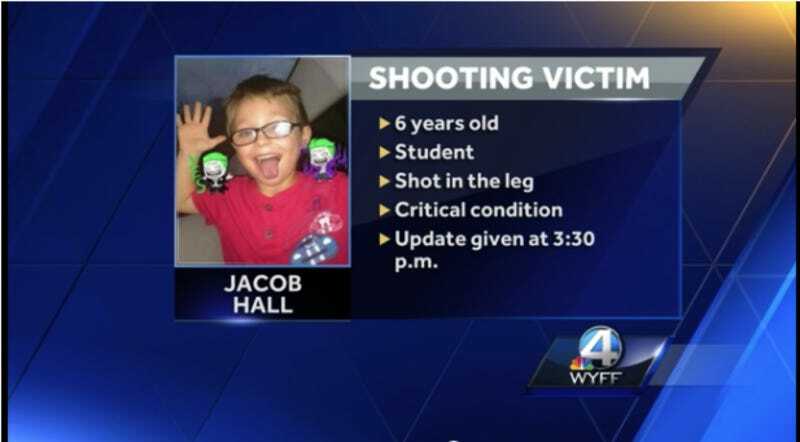 The family of Jacob Hall, a 6-year-old boy wounded when a teenage suspect apparently opened fire Wednesday outside a South Carolina elementary school, says he’s in critical condition and on life support. Hall was shot in the leg and lost a massive amount of blood, leading to serious brain damage. The suspected shooter hasn’t been identified, due to his age; WLOS reports that he’s due in court for an initial arraignment Friday morning. The teenager reportedly called his grandmother’s cellphone early Wednesday, but was crying so hard she couldn’t understand what he was trying to say. His grandparents went to his house, which neighbored theirs, and found the teen’s father shot to death and the boy gone. Besides Jacob Hall, another 6-year-old boy was shot in the foot. He’s been discharged from the hospital. The district’s superintendent told ABC Thursday that the wounded teacher managed to close a school door, lock it and usher the other children inside to safety.